Stumbled across a slew of gig flyers, randomly sprinkled throughout various storage boxes the other day. I attended the Rocket from the Crypt / Sahara Hotnights show at Chicago’s Metro back in 2001, I think? We made the trek from Milwaukee and the show was not a disappointment. 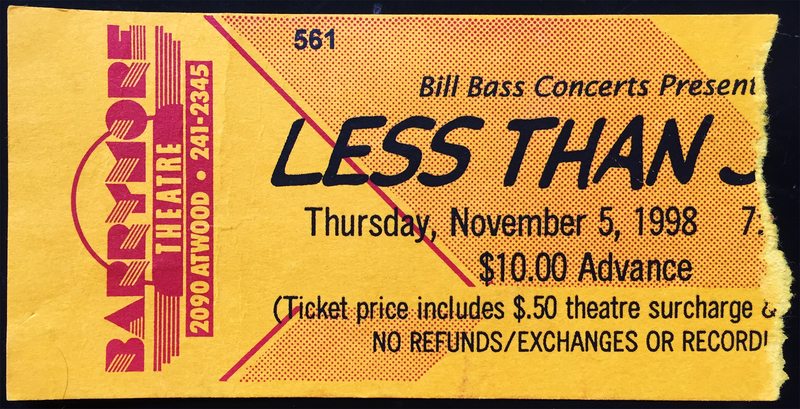 Interesting to see the Yeah Yeah Yeahs and … Trail of Dead on this same flyer, both bands I would come to admire AFTER acquiring this little memento. Anyway, more flyers to come! The latest acquisition to the family library is this swingin’, 6-LP Reader’s Digest box set, Swing Hits. 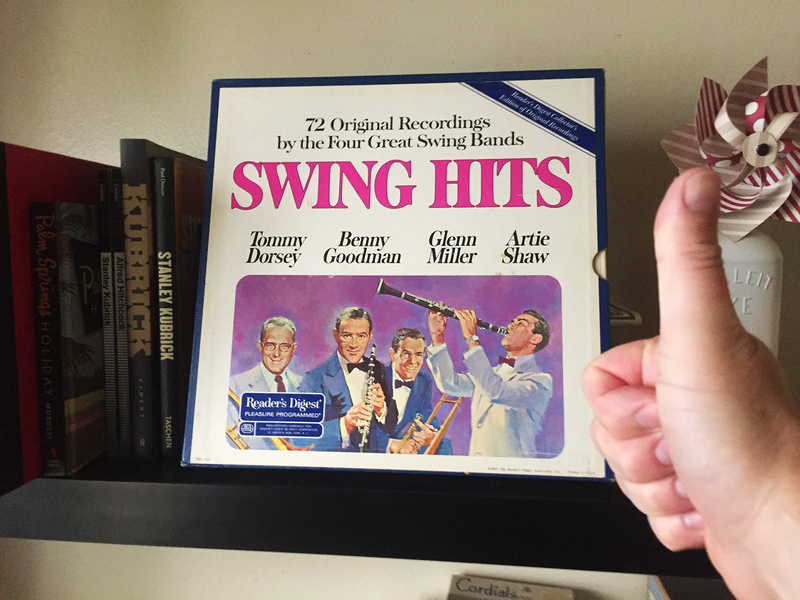 Featuring Artie Shaw, Benny Goodman, Tommy Dorsey, and of course, Glenn Miller, this amazing gift was a thoughtful and welcoming gesture from the in-laws, and was actually owned by my wife’s grandfather. Many thanks for this great gift set! Rest assured, she’ll be well taken care of. Here’s to a swingin’ weekend, kids! Still Bill is the second studio album by soul legend William Harrison Withers Jr., and was released in 1972 on Sussex Records. 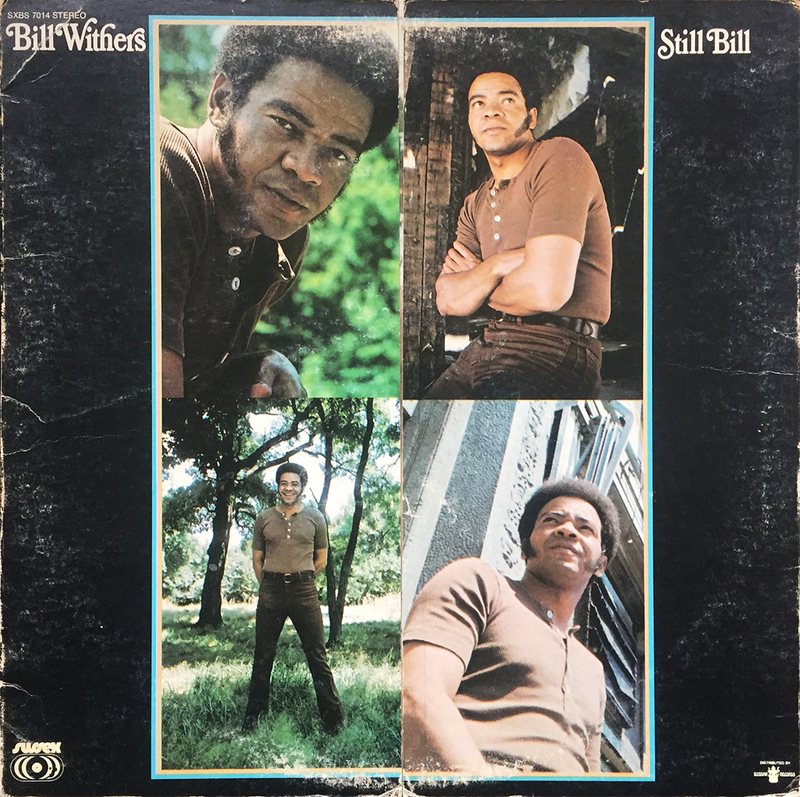 Featuring the classic, Lean on Me, Still Bill is essential Bill Withers material. Also included is the classic Use Me, and Who Is He (And What Is He to You?) 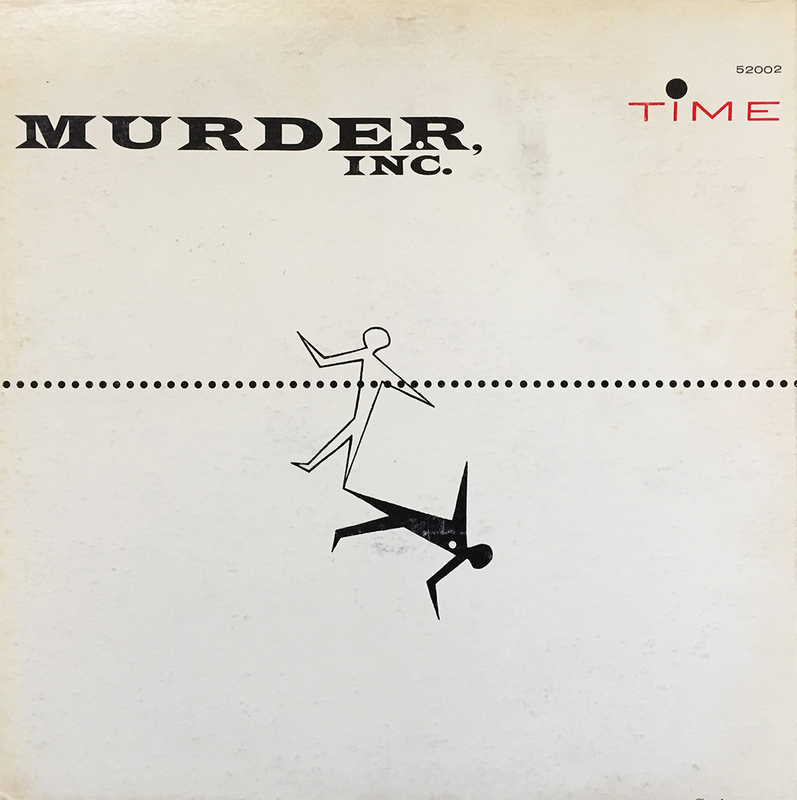 which was featured on the soundtrack to Quentin Tarantino’s 1997 classic, Jackie Brown. This copy has certainly seen better days, but was a no-brainer for $1 at Goodwill. If you don’t already own this classic album, check it out. 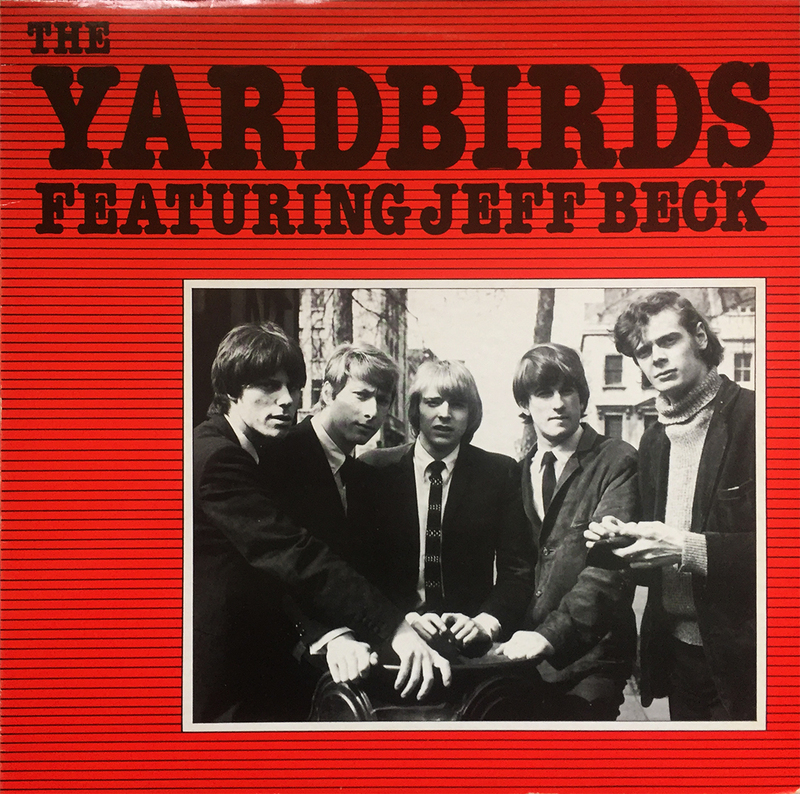 This 1982 compilation record featuring Jeff Back and The Yardbirds was released in the UK back in 1982. The 10 tracks feature the band’s work between 1964-65, and is a must find for classic rock and blues rock lovers of all types. Though I much prefer my Yardbirds with a little Jimmy Page, this album is still a must-own. So, as it turns out, the lesser-known Hugo Winterhalter was an arranger for such household names as Tommy Dorsey and Count Basie back in the 1930s before branching out into his own easy listening jazz career. 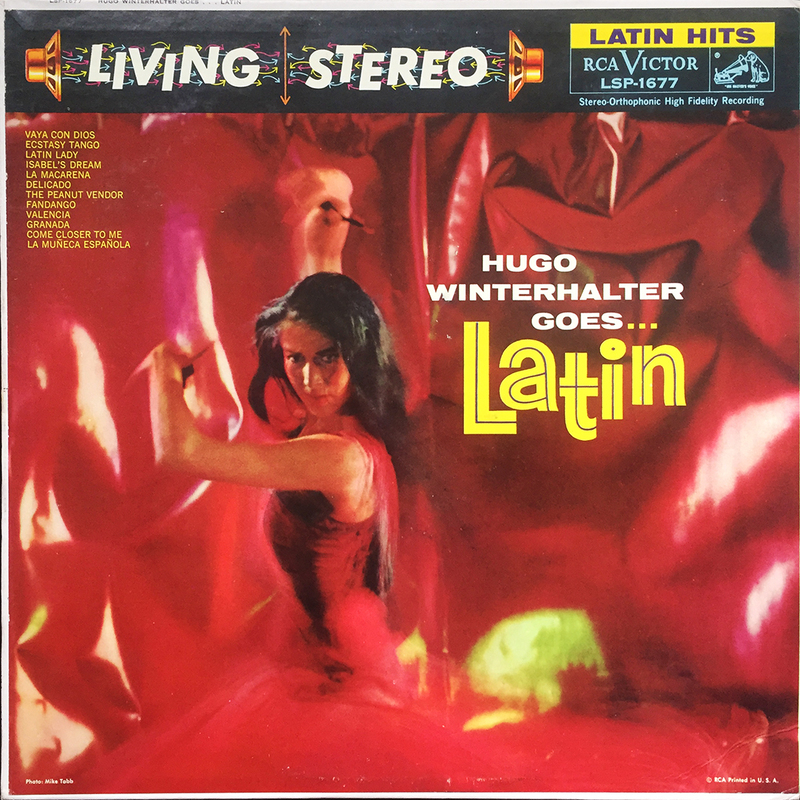 This 1959 album, Hugo Winterhalter Goes… Latin features 12 tracks of Latin fury, and owns classic, mid-century cover art. With RCA Victor’s Living Stereo, you’re sure to experience Isabel’s Dream and Ectasy Tango in high quality fidelity. Jimmy Ray Dean held a prolific career as a television personality (The Jimmy Dean Show), a country music star (Big Bad John), and of course, creator and spokesman for the classic Jimmy Dean sausage brand. 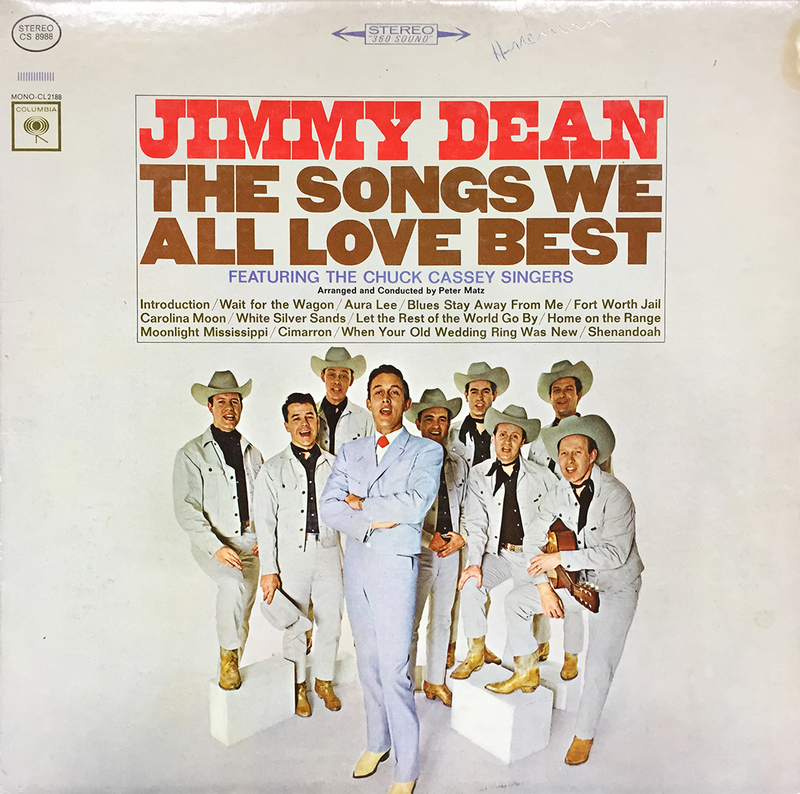 This album, 1964’s The Songs We All Love Best, was Jimmy’s 11th studio album, and was released on Columbia Records. A little Jimmy goes a long way, but how many other country musicians have their own food line to accompany their music? Not many, I’ll tell you that. 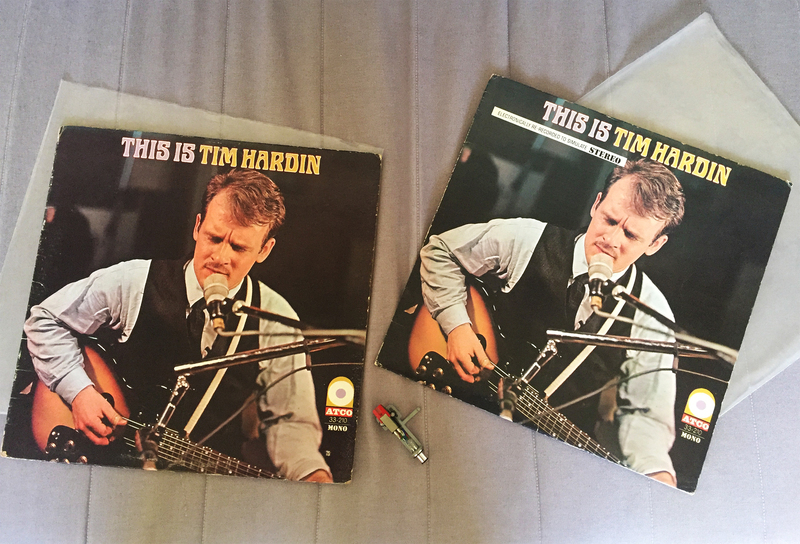 So… I busted my needle yesterday… on Tim Hardin’s This is Tim Hardin. Lucky for the household that we have “spare” turntables scattered around, so I was able to get my (much-needed) Hardin fix. Now, in addition to being sick for destroying a few choice Hardin grooves, I’m in the search for a replacement needle. It never really ends. 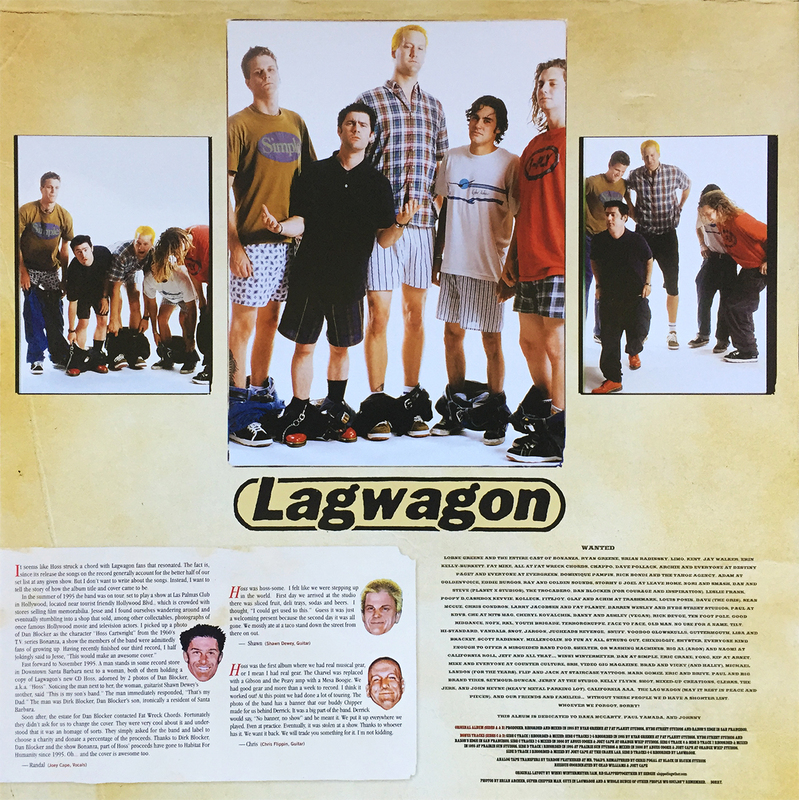 Though I’ve been in (clenched) possession of this amazing Lagwagon box set for 6 years (Putting Music in its Place… the 10 LP box set… you remember…), I hadn’t, until today, noticed this stellar insert for the double Hoss LP. The photo is of high enough quality for you to zoom in and have a laugh to the bottom left corner’s brief history of the album. The center band photo was used in 1994’s Fat Wreck Chords comp, Survival of the Fattest (I remember it from my high school days), but to my knowledge, the photos on either side are exclusive to this release. Anyway, I found this particular story to be quite humorous. Man… two hype stickers in a row? What the hell is goin’ on?! Getting hyped for the weekend, yo! Fine enough… sounds legit. 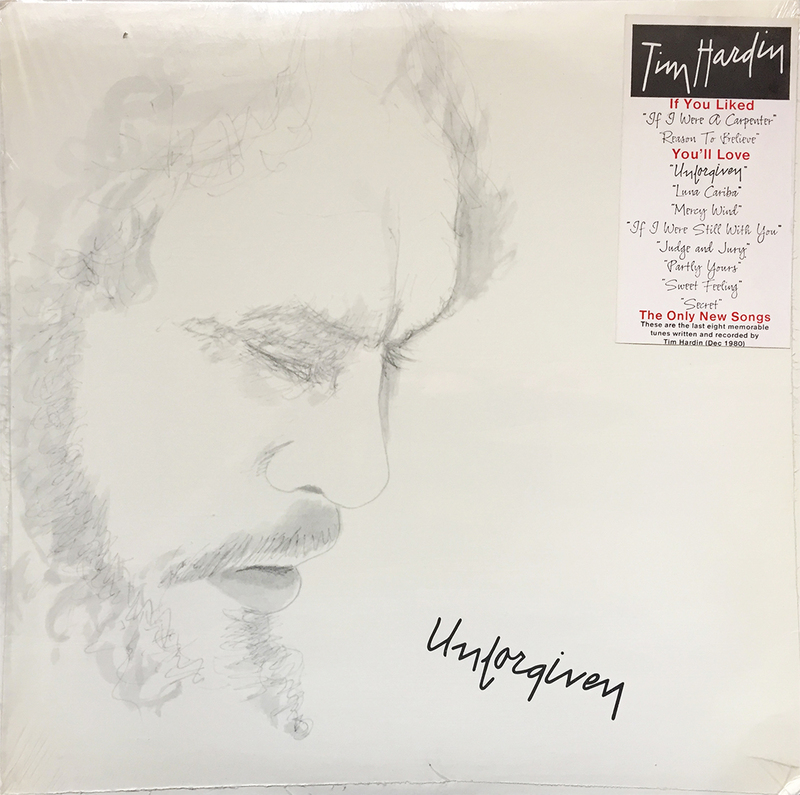 Up for unbridled enthusiasm is this nifty hype sticker to Tim Hardin’s last studio record (more on that here), 1981’s Unforgiven. This rare little glimpse into the marketing minds of yesteryear should get even the casual Hardin fan something to look forward to. 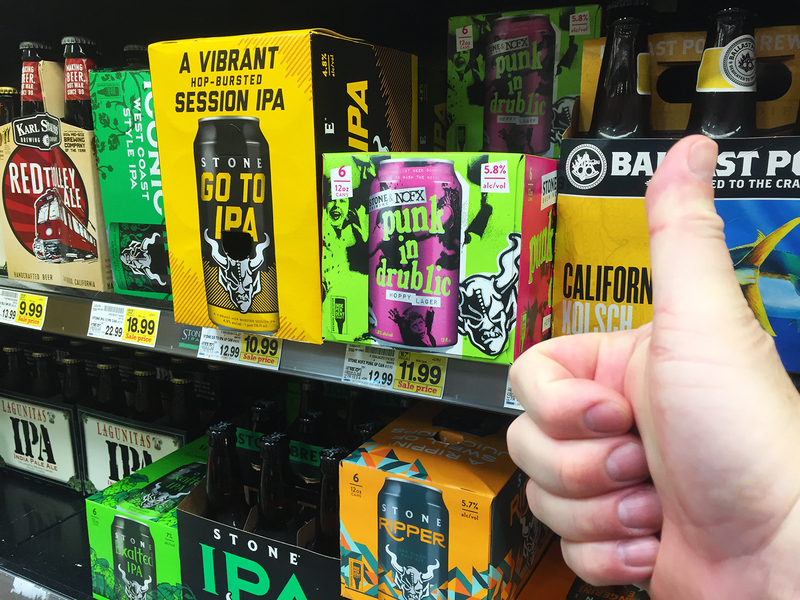 Here’s a little secret… it’s worth the hype. 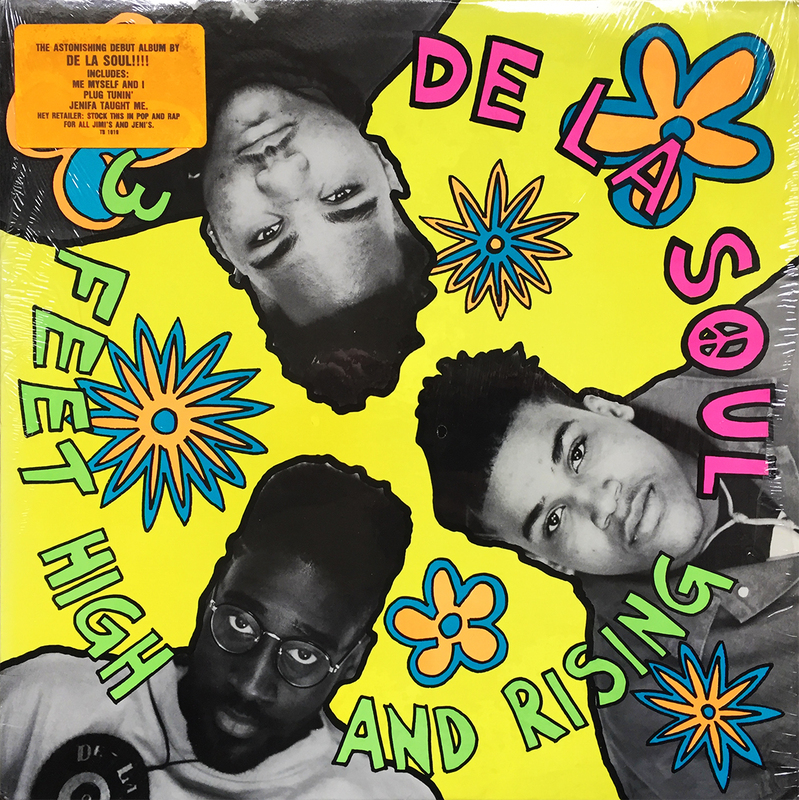 1989’s Three Feet High and Rising is the first (of three) collaborations between production pioneer Prince Paul and Long Island-based hip hop moguls De La Soul. Both a critical and commercial success, Three Feet harbors a unique brand of positive, conscious hip hop that was virtually unheard of in the late 80s, and would help to jettison a lucrative and fulfilling career for both parties. By far my favorite release from this essential band, Three Feet is critical for anyone wanting to simultaneously laugh, and swim inside intelligent hip hop grooves. If you don’t already own this, bump it to the top of your list. So, we missed the 2000 window by little over three months, but this live performance by quirky kings, BS 2000 was well worth the wait. Having grown up a Beastie Boys fan, I quickly began exploring any and all side projects by any and all members of the band. When BS 2000 released their second album (of two), 2000’s Simply Mortified, our hopes of a small, yet local tour were happily met with a rocket of anticipation. 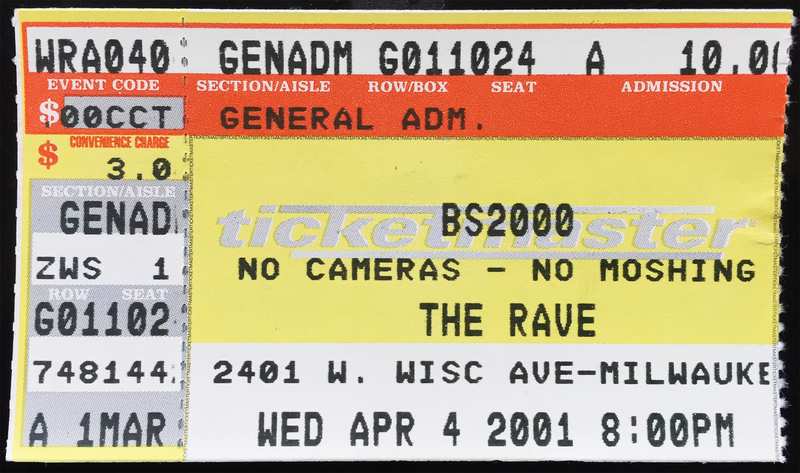 Seeing Ad-Rock (Adam Horovitz) and AWOL (Amery Smith) jam on a pair of keyboards and jumping around like fools was perfect for a much-needed mid-week show at The Rave in Milwaukee. This was 17 years ago now, but a handful of vivid memories from this evening will never be forgotten. Hype stickers rarely lie, at least, that’s my humble opinion on the matter. 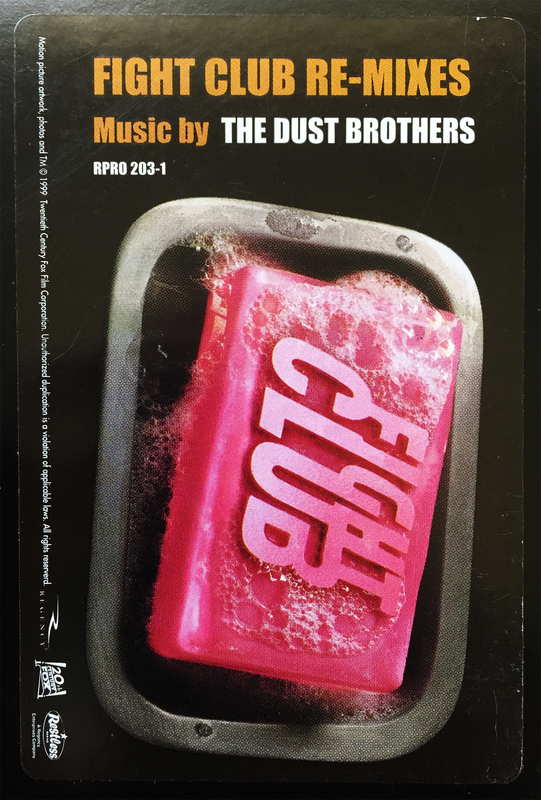 So what surprises me about this Dust Brothers promo of Fight Club Re-Mixes is the blinding, and ridiculously cheap asking price for near mint copies. Keep in mind that this 6-track 12″ is pressed on red vinyl (for those of you into such things.) But $6 for six Dust Brothers remixes of Dust Brothers songs, that seems asinine to me. Anyway, it’s (clearly) a must have, and can be nabbed for cheaper than a Taco Tuesday lunch. Leave it to Mondo. Am I right?! 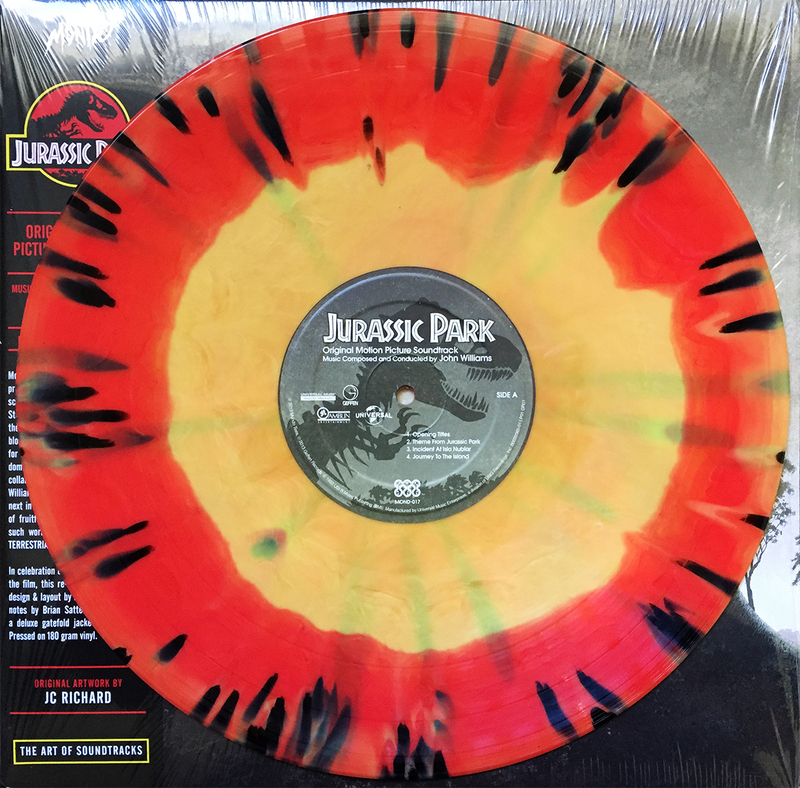 At the end of May they reissued the 2 LP soundtrack to John Williams’ Jurassic Park. This 180g yellow and red swirl with black splatter color variant showed up on their site for about a day, and is now no longer available. 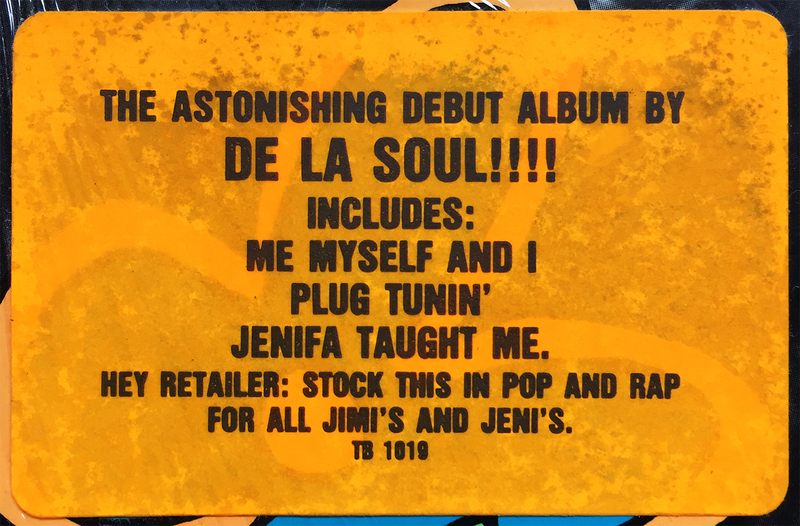 Preowned copies are up on Discogs for $79 to $199.99, so I’m glad I ignored my hesitation and nabbed this gem when I did. 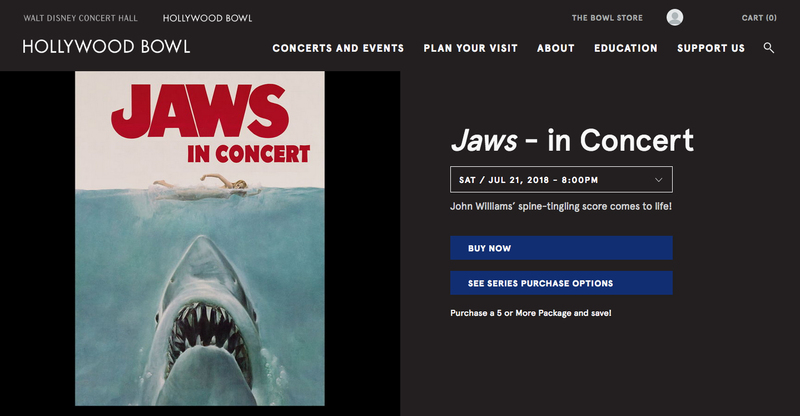 Nobody beats John Williams. Nobody. FINALLY completed the much anticipated (and surprisingly elusive) discography with, what appears to be, the last recorded songs by this embarrassingly underrated legend, Tim Hardin. Unforgiven was released in 1981, after Hardin’s unfortunate, yet unsurprising death. 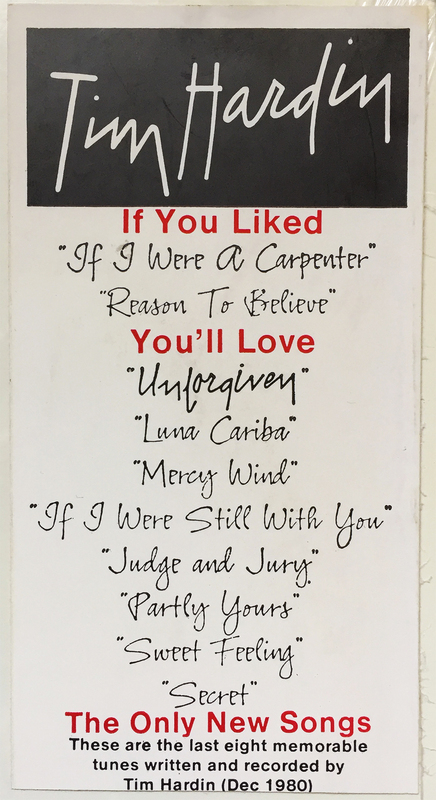 As the hype sticker indicates: These are the last eight memorable tunes written and recorded by Tim Hardin (Dec 1980). This is now the second time I’ve purchase this album, which I was (obviously) reluctant to do. You see, I’d shelled out $40 for this exact pressing just under two years ago, but it never arrived, and I was out the $40. This time around, Unforgiven arrived sealed. Virgin vinyl, kids! Like with anything Tim Hardin touched, this is essential spinning material. 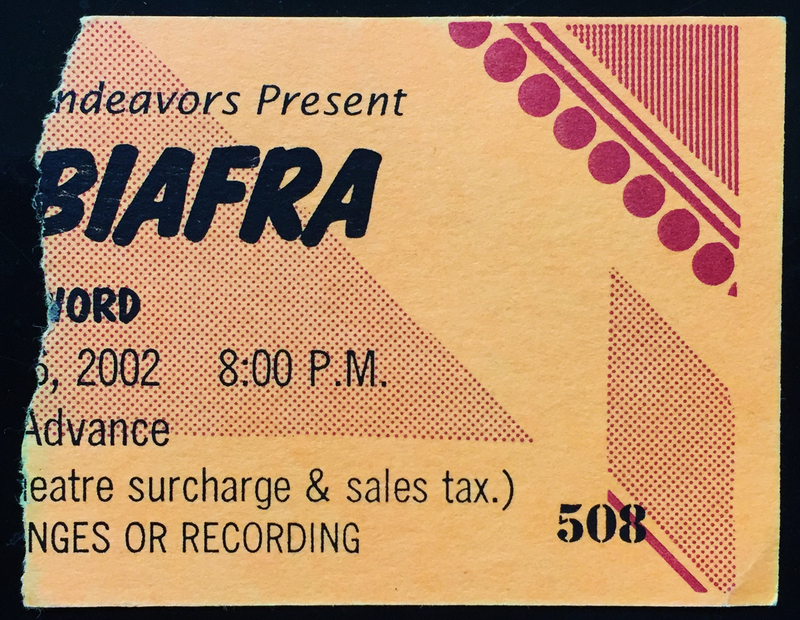 Witnessing Jello Biafra’s spoken word performance at Madison, Wisconsin’s Barrymore Theatre was something of a marathon… to say the very least. I’m happy to have experienced this entertaining sprint, though the unexpected 4+ hours eclipsed the rest of our evening’s planned activities. All of this is irrelevant, of course, because we were told, firsthand, about the brutal and legal-laden break-up of the Dead Kennedys. If invited to do it all again, I’d probably say yes, which is what you should say if you see Jello’s name pop up on one of your local theater fliers. The man is a legend, a pissed off legend, but certainly worthy of the nominal cover charge. Spotted this lager for only the second time in my Los Angeles travels. Thanks to the band’s insensitive comments in Vegas a few weeks ago, this mediocre treat is now discontinued. Pick it up if you see it. You won’t very shortly. 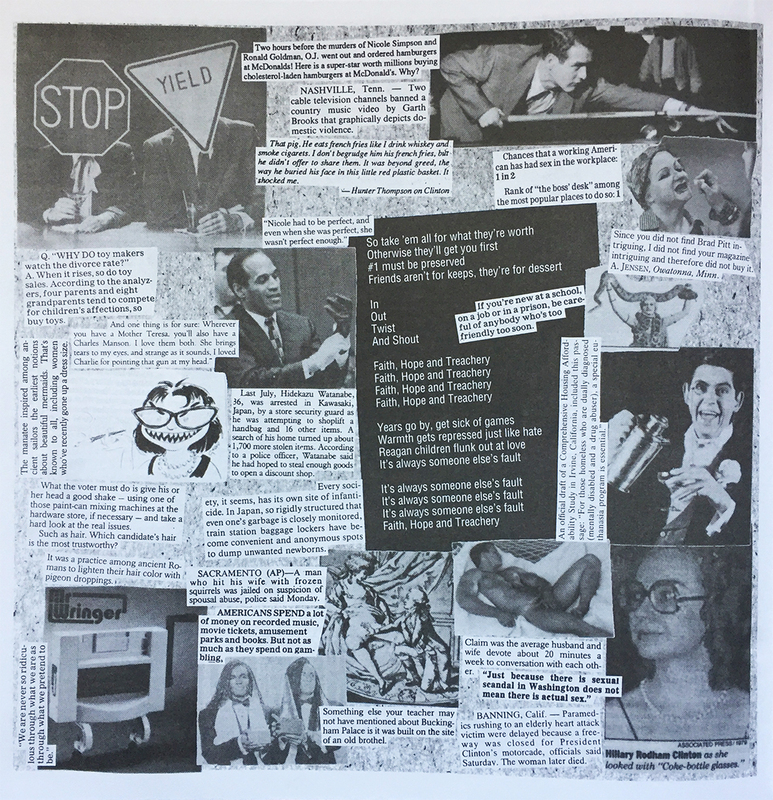 Lots to, let’s say, digest in this collage insert from Lard’s 1997 masterwork, Pure Chewing Satisfaction. Keep in mind, this is just one page (out of 30) that accompanied this album. It would take someone close to a year to read the entire booklet (purely estimating here), which is about par for Jello Biafra-related releases (Plastic Surgery Disasters, and I Blow Minds for A Living come to mind).